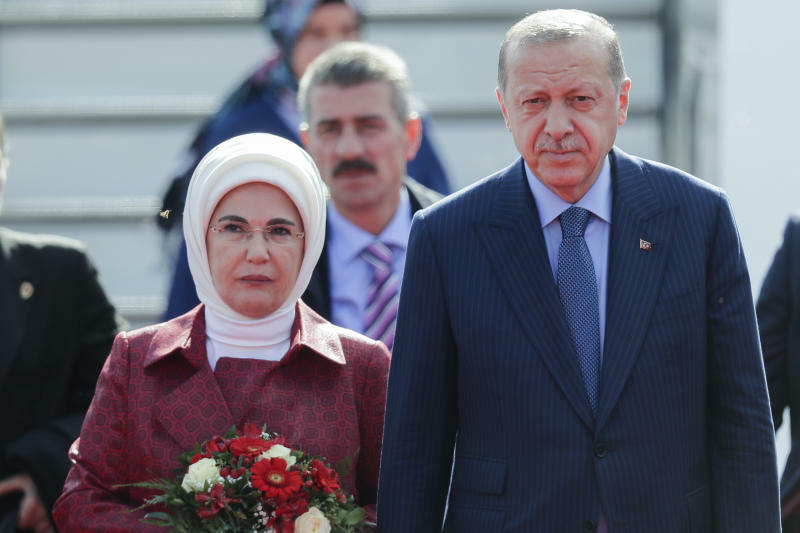 BERLIN (AP) — Turkish President Recep Tayyip Erdogan arrived in Germany Thursday for a visit aimed at reducing tensions between the two NATO allies at a time when Turkey's economic troubles are causing growing concerns and Europe needs Ankara's support to keep down the flow of migrants. The trip is Erdogan's first formal state visit to Germany, which is home to more than 3 million people with Turkish roots. But the increasingly authoritarian leader is viewed with suspicion across the political spectrum in Germany, which has had difficult relations with Ankara in recent years. It escalated in the past year to the point where Erdogan called Germany's mainstream parties "enemies of Turkey" and accused German officials of acting like Nazis, prompting Chancellor Angela Merkel to condemn the Turkish president's words. At the same time, the two countries recognize mutual strategic interests and the two leaders appeared prepared to bury the hatchet ahead of the trip, which runs until Saturday. "We have a fundamental interest ... in an economically and politically stable Turkey, and of course in a Turkey in which democracy is practiced," Seibert added. He said that talks with Erdogan will address both "common interests" and difficult issues. In an opinion piece in Thursday's Frankfurter Allgemeine Zeitung newspaper, Erdogan said it was time to "set aside our differences of opinion and concentrate on our joint interests." Merkel championed a 2016 agreement with Turkey designed to halt the flow of refugees and migrants into Europe, which has held up even as relations between Ankara and the European Union soured. And Berlin considers Turkey an important partner in trying to end the conflict in neighboring Syria. But there has been a series of setbacks to bilateral ties. Among the irritants have been a 2016 German parliament resolution labeling the early-20th century killing of Armenians in Turkey as "genocide." 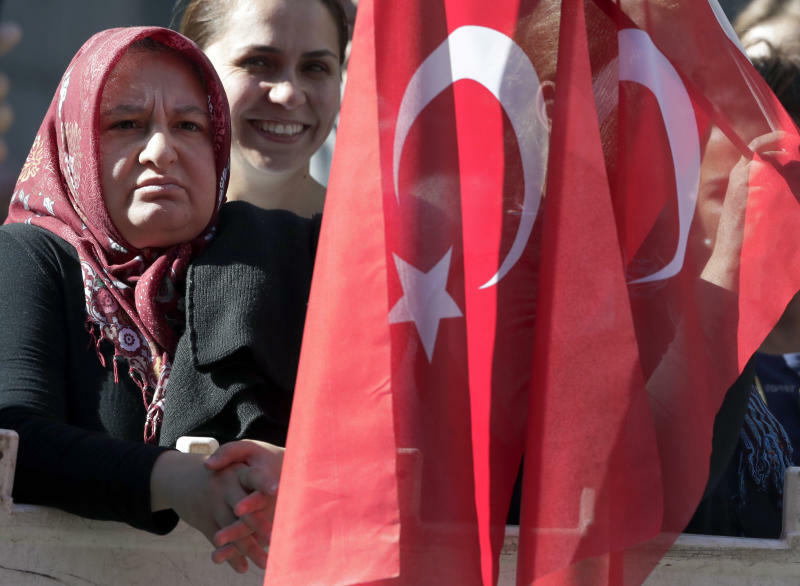 Turkish officials' attempts to rally support among their citizens living in Germany last year in a referendum over whether to expand Erdogan's power caused widespread irritation, and several of their public events were canceled — prompting the Nazi jibes from Erdogan. Most damaging was the jailing of Germans amid mass arrests and firings by Turkish authorities following a July 2016 coup attempt. Germany's foreign ministry says 35 were imprisoned on what Berlin considers political grounds. While the most prominent — including two journalists — have been released, five remain in Turkish custody. In recent months, officials in both countries have sought to thaw relations — particularly on the economic front, something that has gained urgency as Turkey grapples with a currency crisis heightened by tensions with the U.S. over the case of a detained American pastor. 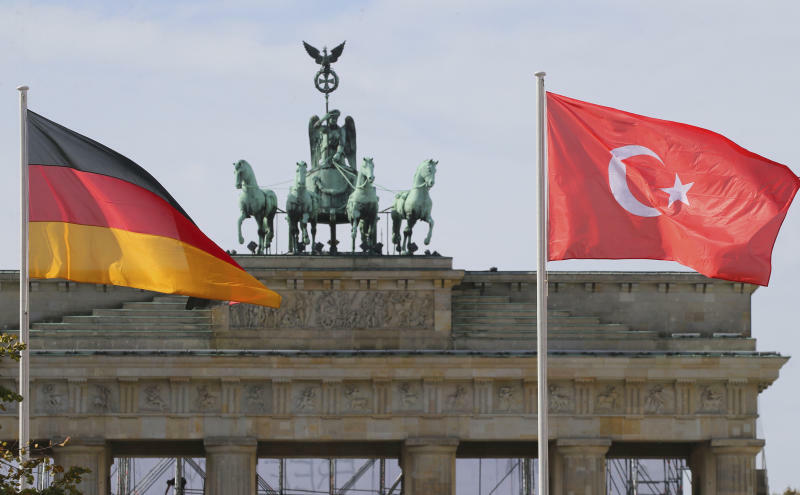 While Berlin has said the question of German aid for Turkey "does not currently arise" and emphasized the need for Turkey's bank to be independent, it has made clear that it doesn't want an economic basket case on Europe's doorstep. Erdogan landed in Berlin Thursday but has the bulk of his public engagements on Friday, when he will meet Merkel and attend a state banquet hosted by President Frank-Walter Steinmeier — an event that many German opposition politicians are refusing to attend. Finance Minister Olaf Scholz and Economy Minister Peter Altmaier will attend. Ahead of Erdogan's visit, the pair met in Berlin last week with Turkish Finance Minister Berat Albayrak, who said he saw a "new era" dawning in relations and declared that "we have left the process of tensions behind us." After a second meeting with Merkel over breakfast, Erdogan will wrap up his visit on Saturday in Cologne, where he officially opens a new mosque built by a group with ties to Turkey. Demonstrations against the Turkish leader are expected in both Berlin and Cologne, and Amnesty International called for Merkel to use her meetings with Erdogan to address the "dramatic human rights' situation in Turkey." "In such a situation, a state visit must be used to advocate clearly for all arbitrarily and innocently imprisoned people," the organization said. Police in Berlin shut down a large area around the chancellery where Merkel was to meet with Erdogan, including the airspace and boat traffic on the Spree river.